140.6 Decal Sticker Ironman Triathlon Cycling *NEW 6"
Women's one-piece triathlon suit size medium tri zoot pearliuzmi. Condition is New. Shipped with USPS First Class Package. Alé Mens Triathlon Top size Medium record 2017. Condition is New. Shipped with USPS First Class Package. 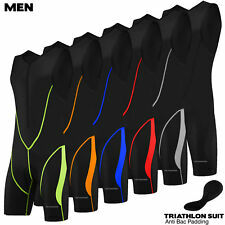 Women's one-piece triathlon suit size SMALL tri zoot pearliuzmi. Condition is New. Shipped with USPS First Class Package. M Zoot Tri Tank and L Tri Shorts (matching) - PINK! Very Pink and Very bright! Again - Tank is a size M and shorts are size L. Both fit a bit smaller than I would expect. Project Mens Classic ITU Edition Triathlon Suit. New without tags. Has a front zipper, 2 rear pockets, and minimal padding. Mens size medium. Zip Front. Interior Padding Between The Legs. High Performance Lycra Sport Fabric. SPF/UV Protection. Strong Flat Lock Seams. - Chest - 13.5". (Vinyl stickers for your car or notebook or phone case or fridge or smth)) 8cm | 5cm | 3cm width. Got a lot). Your kind understanding and patience will be highly appreciated. Color: RED. Zoot Men’s Tristhlon Top, Half Zip, Sleeveless, LG, Blk. Condition is Used. Shipped with USPS First Class Package. ULTRA-LIGHT - At only 525g ( 1.1 lb ), the Himal is ultra-light yet tough. 70D RipStop fabric TPU lamination Heat taped seams = A waterproof pack that’s so light that you might even forget you’re carrying it! Triathlon women's Tri Top size Small with pockets new with tags. Condition is New. Shipped with USPS First Class Package. New Sugoi RS Tri Short. Team Gold Country Triathlon Club Logos on Side. Great for the Swim, Bike, and Run.